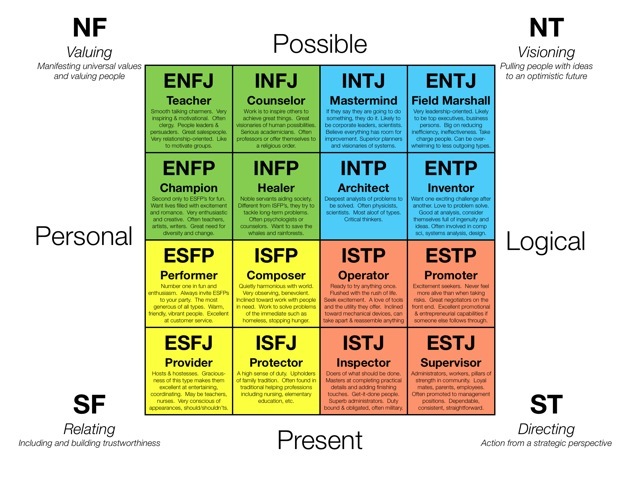 I recently did some research on personality types and found it to be quite interesting. I found this site that describes in detail 16 different personality types. You can check it out here. The site looks a bit outdated, but the information there is excellent. You can figure out which kind of personality you are, then you can see things like, what kind of people you match up with well, and what kinds of jobs are good for people like you. 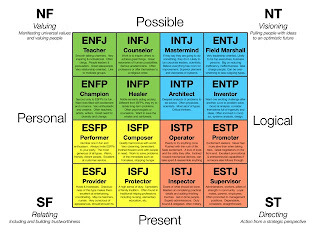 I turned out to be an ISTJ which stands for Introverted Sensing Thinking Judging. It was fascinating to read the description. It's like they know you better than you do. If you ever have trouble describing yourself, find out which of these personalities suits you and it will give you a ton of ideas. One thing I found interesting was the stats they revealed. I figured most people would fit into the same few personalities and maybe a small percentage would fit into others, but according to their survey, the spread is very even throughout all 16 types. And these personalities span from one end of the spectrum to the other. That means that there are so many different personalities out there. It really explains how people are so different from each other. It makes me wonder, how is this possible. Why are people so different when it comes to who they are, what they believe and what they value. It brings up the topic of nature vs. nurture. Are people born with a personality type, or do they learn it? They say you can change your personality, so maybe it is a little bit of both. Whatever the case may be, this topic of personality is very interesting and everyone should learn about it.